Ker Puja is an important ritual observed in Tripura State of India during the Shraban or Shravan month. Kerpuja is performed for the welfare of the people and it is a tradition that was started by the erstwhile rulers of the region. It is traditionally a tribal festival. In 2019, the date of Ker Puja is July 25. A special area is demarcated for Ker puja. Once the puja starts no person is allowed to enter or leave the marked area. Generally, a barrier made of bamboo announces that Ker is going on in the area. Ker puja is observed according to tribal beliefs and practices to secure the people from disease, epidemic and disasters which may cause harm to a hoda or a village. 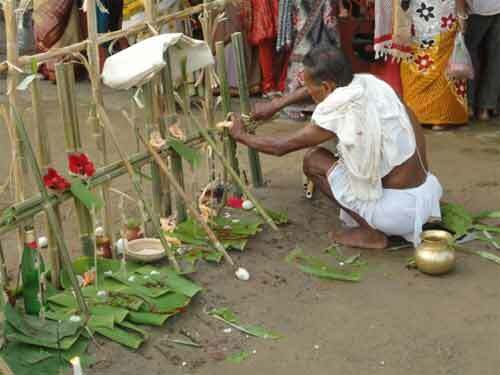 The puja is a must for the Halam tribe was initiated by the Tripura Rajas. A large piece of bamboo when bent in a particular fashion assumes the image of Ker. The literal meaning of Ker is boundary or specified area. Two age old beliefs are associated with the ritualistic incantation of specified boundary for the Ker Puja. One is to safeguard the interest of the people from any calamitous misfortunes and diseases. The other is to save people from any external aggression. Offering and sacrifices are an important aspect of Ker Puja. Earlier during the Ker Puja, all entrances to the capital were closed for two days and a half. During the celebration, everyone, including the rulers were to strictly follow the numerous restrictions. The citizens were obliged to remain in their houses, and were allowed to go outside only twice that too for a few hours. People were not allowed to put on shoes, to light a fire, to dance, sing etc. All those who violate these had to pay fine. The restrictions are very in few in modern times. It is observed on Shravan Krishna Paksha Ashtami. Ker Puja is organized around 15 days after the famous Kharchi puja at Chaturdas Devata Temple.